‘Tis the season to embrace all things scary. And for those who are not faint of heart, Halloween is the perfect time to visit a haunted house. We’re not talking about those cheesy, man-made attractions where zombies jump out at you (although, those can certainly be fun, too). We’re talking about the real homes across America that have a history of stories involving ghosts and paranormal activity. Ready to send some shivers down your spine? Here are seven real estate properties that will most definitely give you the creeps, from a historical home that’s supposedly haunted by Thomas Jefferson to a Gothic mansion that's claimed to be haunted by a woman dressed in black. Located in Colonial Williamsburg, this home is said to have belonged to Thomas Jefferson. And guests have claimed they’ve seen Jefferson’s ghost in the home where you can stay overnight. According to Lonely Planet, one guest reported that he'd heard someone say, “Goodnight, Tom” and a chair scrape across the floor “as though someone had stood up to offer his departing courtesies.” Creepy! Once the site of Sheriff George Corwin’s jail in the 1680s where accused witches were executed during the Salem Witch Trials, this home is now a hotel called “The Merchant.” According to the official website, it is said to be haunted by some of the victims of Sheriff Corwin. One in particular is a woman sporting wild, black hair who appeared in a photograph taken by a former tenant. This home in the French Quarter once belonged to socialite Madame LaLaurie in the 1800s. 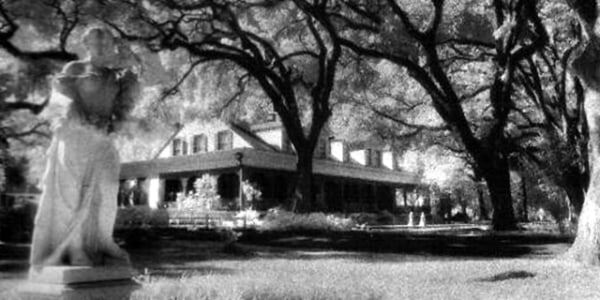 Now, it has the reputation of being one of the most haunted houses in New Orleans, according to Haunted New Orleans Tours. A fire supposedly broke out in the kitchen, which led firefighters and townspeople to discover a torture chamber in the home's attic. LaLaurie was forced to flee the city after an angry mob ransacked the house. Since then, many have claimed to see ghosts in photos and hear screams of agony coming from the empty house. The home is privately owned now so no one is allowed in, but you can still try and spot paranormal activity from the street. This 3,600-square-foot home has five bedrooms, three baths and peaceful water views, but there’s a scary feature: It’s the site of a tragic mass murder in 1974, when a man shot his parents and four siblings (the event inspired books and movies like “The Amityville Horror”). It’s not too scary for some, however, as the home was sold last year after being on the market for $850,000. Another home where a gruesome murder took place is this crime scene turned hotel. In 1892, Andrew and Abby Borden were found axed to death in the house and his daughter, Lizzie, was tried but eventually acquitted for the crime. The home is now a bed and breakfast where you can stay in the "John V. Morse" room where Abby Borden was murdered — it’s even decorated with crime scene photos, according to Lee-Ann Wilber, manager of the inn. “I always say it’s a nice, old Victorian house that has issues,” she told TODAY Home. In the last 13 years, she said she’s seen lights go on and off and furniture switch places. While she slept in one of the rooms, she said, she saw a rocking chair move from the left side of the bed to the right. This home once belonged to Thomas Jefferson’s law professor George Wythe, a very prominent man and also a signer of the Declaration of Independence. According to Leigh Jameson, creative lead of Colonial Williamsburg’s Official Ghost Walk, people have seen a ghost-like woman on the property through the years. She’s shown up standing behind someone in a mirror, and one guest even fainted after spotting her walk into a wardrobe before dissipating. From the inspiration for "The Shining" to the Headless Horseman's hangout, visit the world's spookiest tourist attractions ... if you dare.